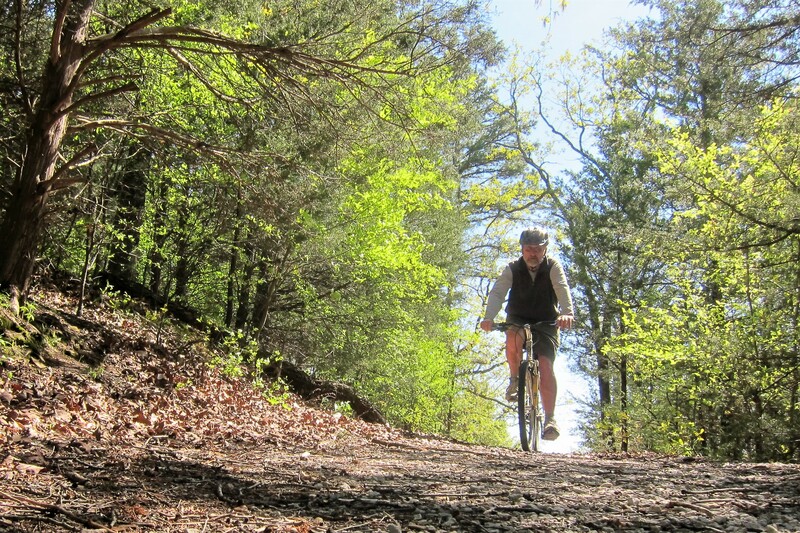 Old roads, old dogs, old folks and old ways still have a lot to offer in this sped up world. 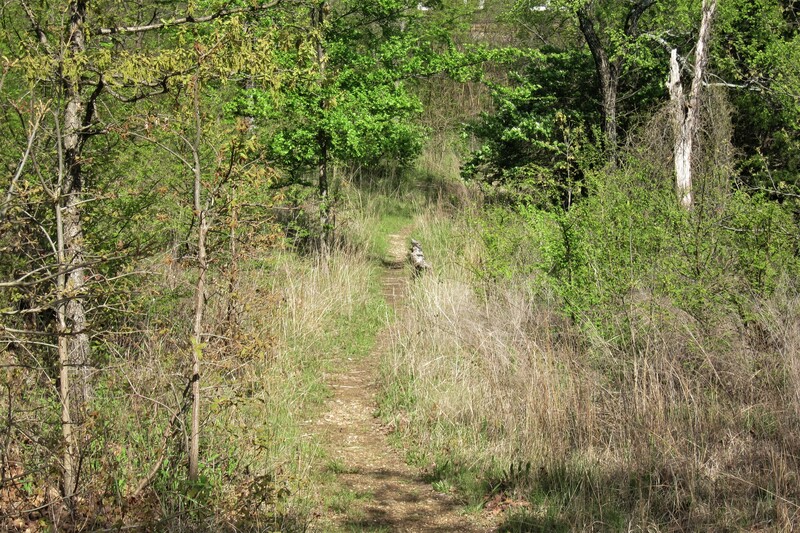 Monday, April 23, 2018-Tenkiller State Park, Vian, OK: The unusual name of this park is derived from the original inhabitants…a Cherokee family called Tenkiller. Couldn’t find any information as to the genesis of the family’s name, but I bet it had something to do with making sure folks atoned for the infamous Cherokee Trail of Tears. Either way, it features an incredible campground! 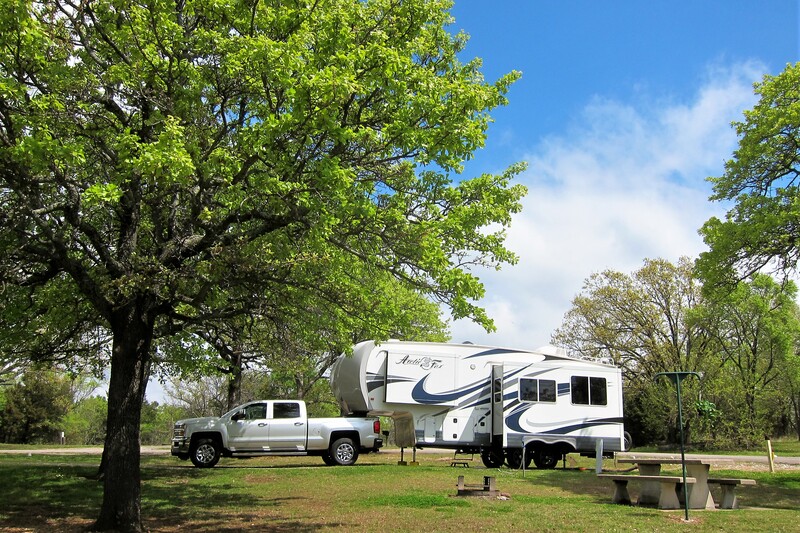 As most state park campgrounds are, Tenkiller is on the rustic side…just the way we like it! The sites are large and most existing vegetation was left in place. 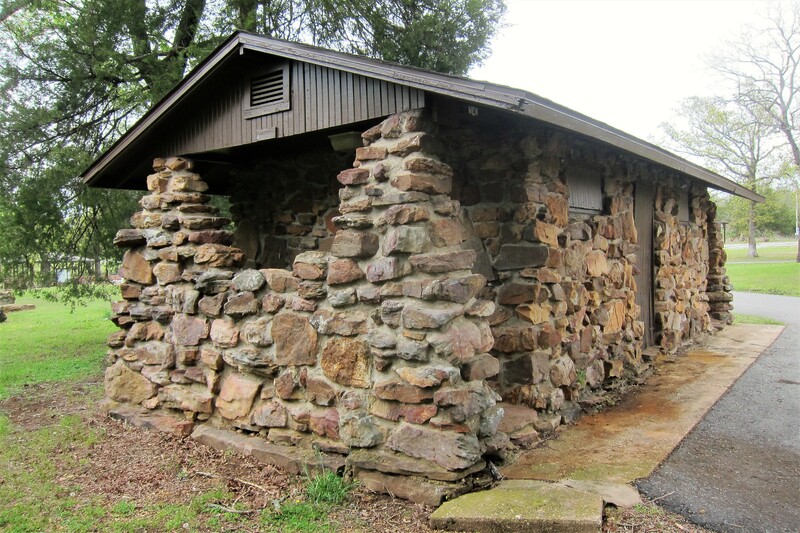 Also, in keeping with the style, the bathhouses are built with native stone. Kit and I spent the day walking about and exploring the park via their fantastic trail network. 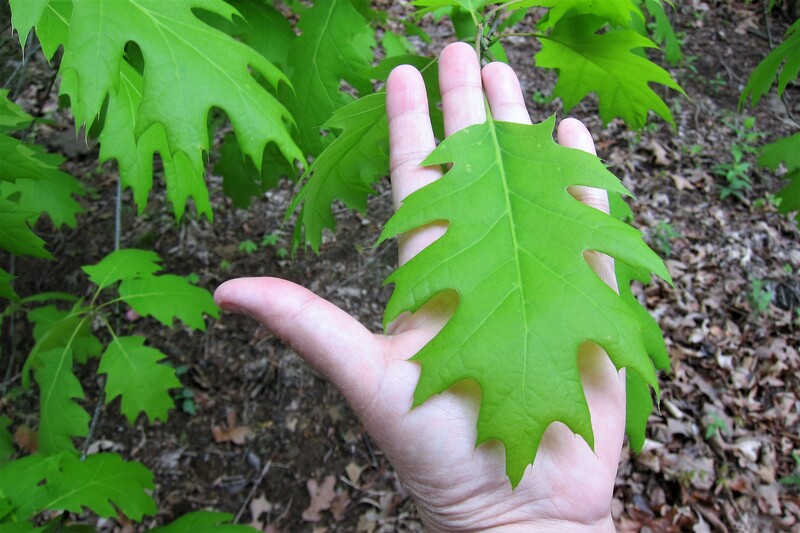 …we rejoiced in all the new spring growth. And to accent the vibrant green were many colorful wildflowers. Reaching the parks namesake lake, Kit and I sat on a bench while enjoying the sun and gentle breezes. 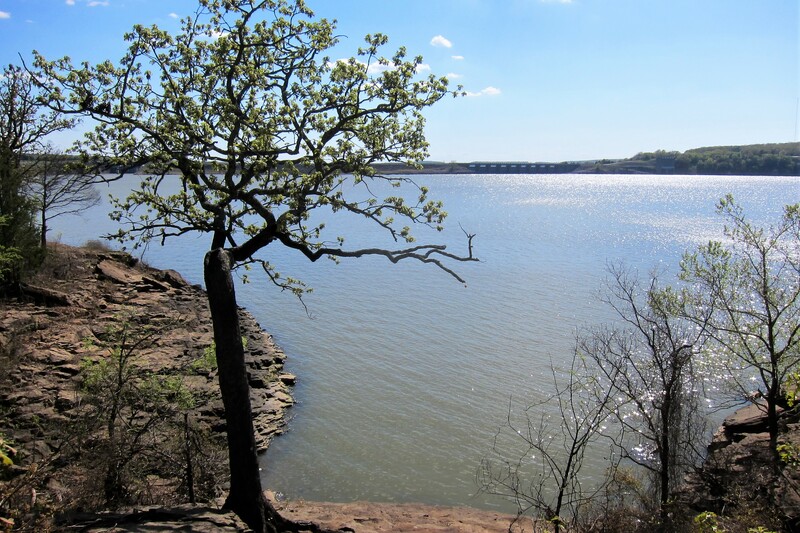 Tenkiller Lake is made by impounding the Illinois River and at 13,000 acres, is a major recreation facility and hydropower station which can generate up to 40 Megawatts of electrical power. Returning to the campsite, Kit wanted to sit in the shade of an Oak tree and do some reading, and I wanted to explore some more…this time by bike. Stopping near an old shed I was overcome by the sense that I was being watched. Yea, kind of a strange sensation…and the guy staring at me seemed a bit squirrely! A great day in a beautiful park…as usual we could justify staying here another few days but need to continue east if we hope to get home before summer is over! 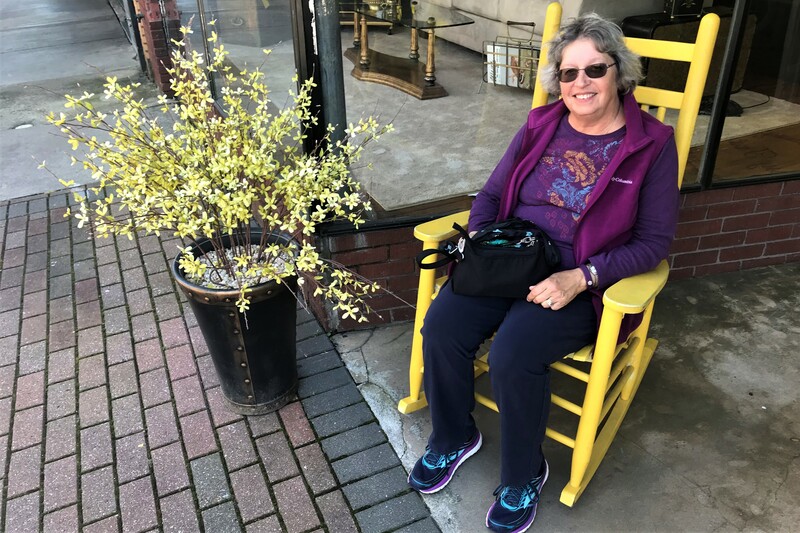 Tuesday, April 24, 2018: Up to partly sunny skies and a temperature of 49 degrees, pulled out and made our way to I-40 to continue our eastward trek. An hour later found us crossing into the state of Arkansas and stopping at a nice rest area for breakfast. Kit whipped up some cheesy scrambled eggs with sausage crumbles, with grilled bread in the skillet…what a great breakfast! Yikes…and I didn’t feel a thing!?!? 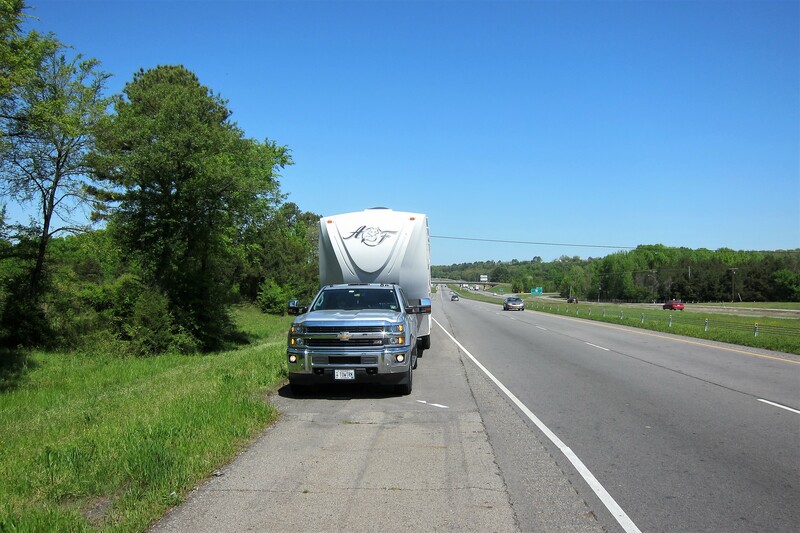 This is the first tire blowout we have experienced in over 130,000 miles of RV’ing and from the experiences of others I’ve learned that modern trailers are engineered to sustain such an event and carry the entire load on the single remaining tire on that side…for a little while. 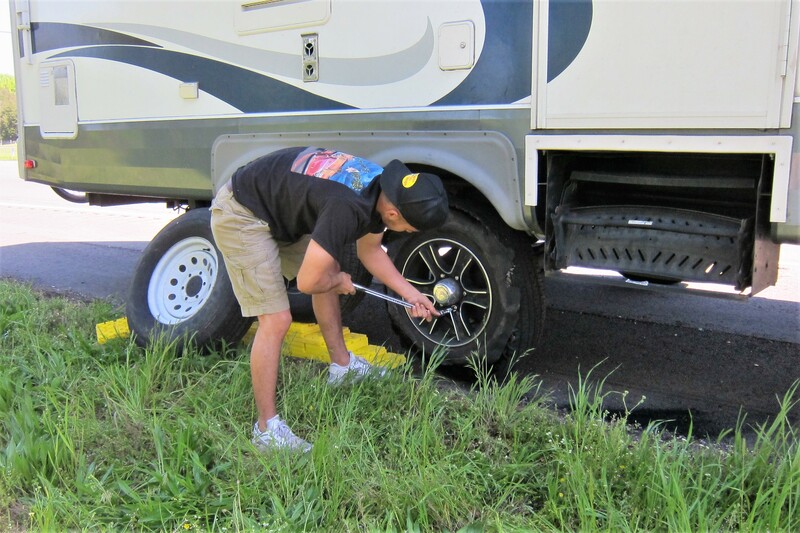 Not having a Tire Pressure Monitoring System (TPMS) for the camper, there was no way to know that we were travelling on three wheels…thanks go to the good Samaritan that notified us! Thinking a TPMS is now in our future. As I was contemplating whether to call roadside assistance, and wait, or just replace the tire myself…this young man pulled his truck over and offered to help. Alberto was on his way to work but had time to assist us…so between he and I, we had the tire changed out in about ten minutes! What a nice young man…makes one feel good about the sort of people us old folks are turning the world over too! He refused payment, but I persuaded him to take it as a token of our thanks! 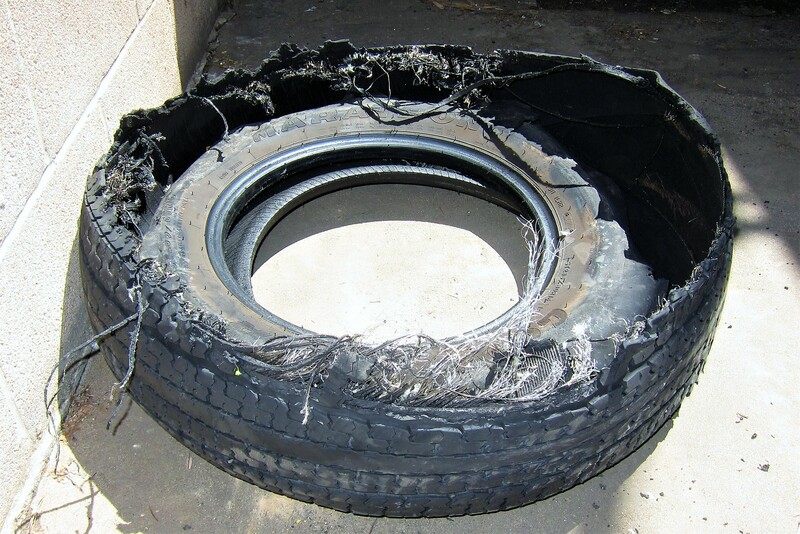 Back on the road, we stopped at a Goodyear store in Russellville, AR to replace the damaged tire…this is what an 80PSI tire looks like after suffering a detonation! I’m meticulous about checking truck and trailer tires at most every place we stop…even monitoring tire and bearing temperatures with an infrared sensor…so, what went wrong? Well, a postmortem by the experts concluded that the tire suffered a tread separation. As you can tell, there was plenty of tread remaining…however this tire, original to the camper, has over 30,000 miles of rough use so I guess it was inevitable. Fortunately, that was the last remaining original as the other three, when they appeared suspect, had been proactively changed out! 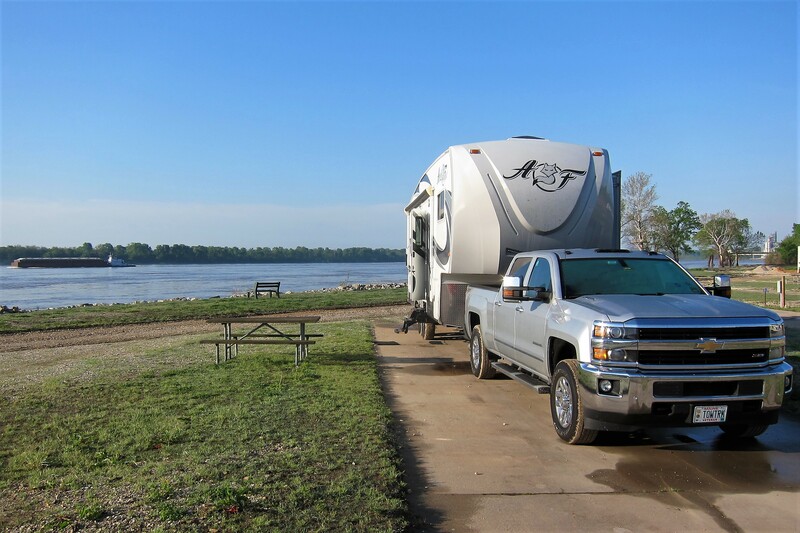 Back underway, we made our way to West Memphis, Arkansas and found the Tom Sawyer RV Park nestled along the shores of the Mississippi River. A nice meal accompanied by a glass of wine, followed by a walk along the river, completed our day. 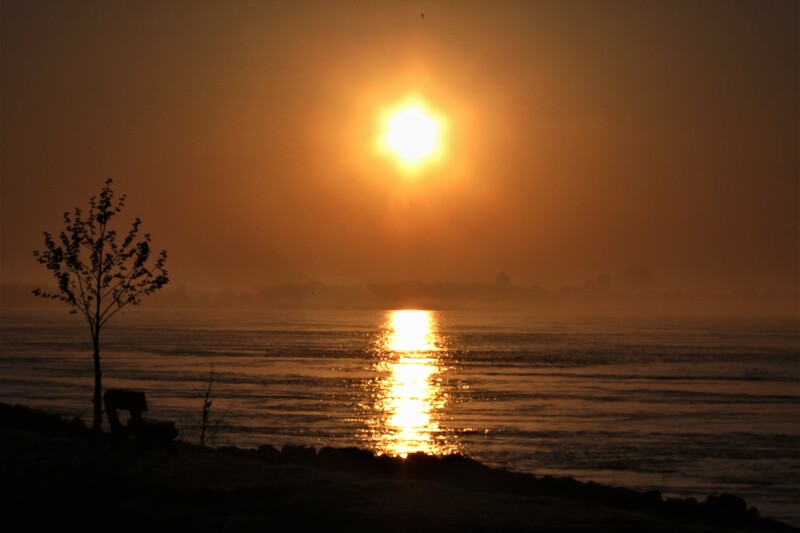 Wednesday, April 25, 2018: Woke early to brilliant sunshine bouncing off the surface of the Mississippi! 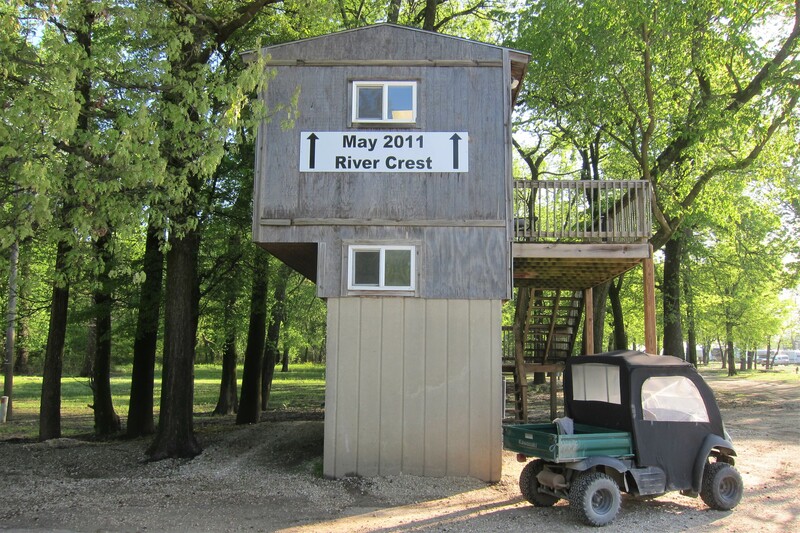 This RV Park is on the river side of a tall levee and everything is built up on stilts, or in the case of the office, built on wheels so it can be hauled out of harms way in case of flooding. The spring snowmelt and rains have brought the Mississippi to a few inches below the riverbank, and all the campers realize that when the word is given it’s time to bugout! So how high can the Mighty Mississippi get at flood stage? Well, the sign on the second-floor laundry building tells the story! No concern to us, we had planned to leave today anyway! 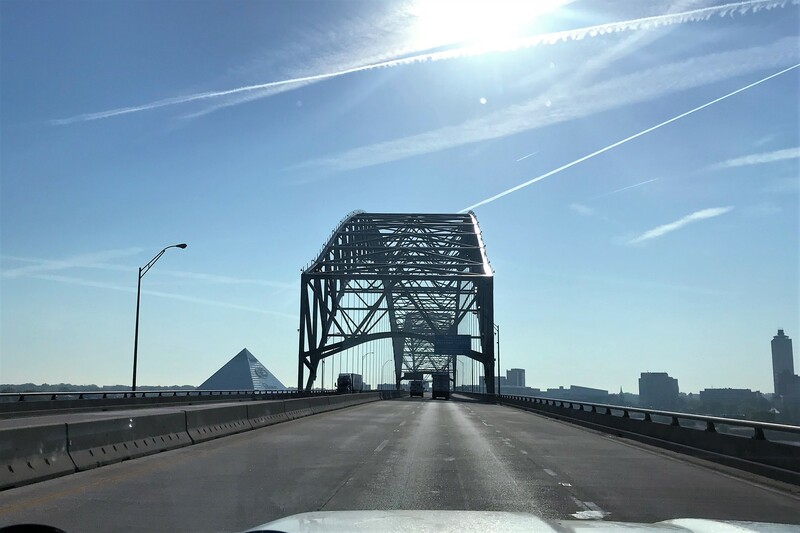 And so, Kit and I hit the road at 0821 hours and headed back to I-40, crossing the Mississippi River into Tennessee. Nearing 1000 hours, and not having breakfast yet, Kit and I were getting a bit hungry as a billboard appeared advertising a Cracker Barrell Restaurant at the next exit…so exit we did and enjoyed a nice fulfilling meal! Back underway we motored through Tennessee until about 1700 when Kit found a TVA campsite near the town of Lenoir. Being prime camping season in these parts the campground was packed…in fact, we scored the last available campsite, but it was a bit tight. However, at only 30 feet long, we were able to squeeze our camper in by jackknifing the rig. Could have disconnected and parked the truck alongside the camper, but since we were leaving in the morning, didn’t want to go to the trouble. No dinner, just snacks…we were still stuffed from this morning’s breakfast. 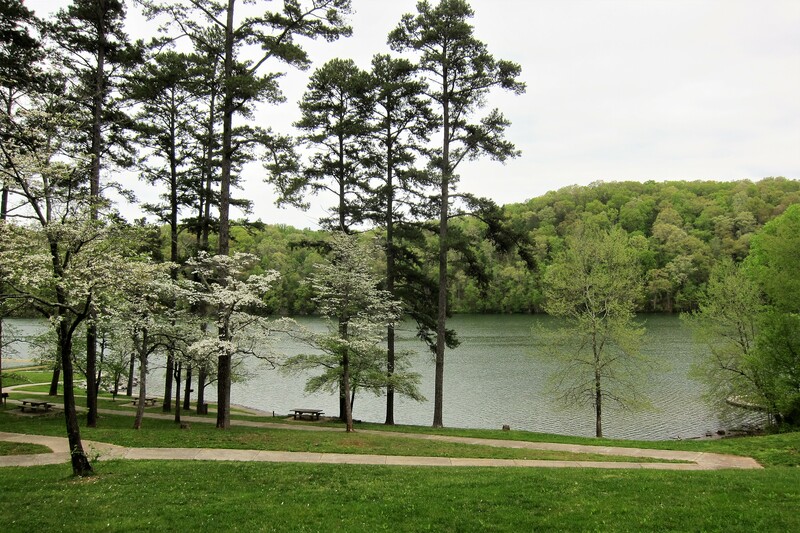 But did take a walk about this nice riverfront campground run by the Tennessee Valley Authority. 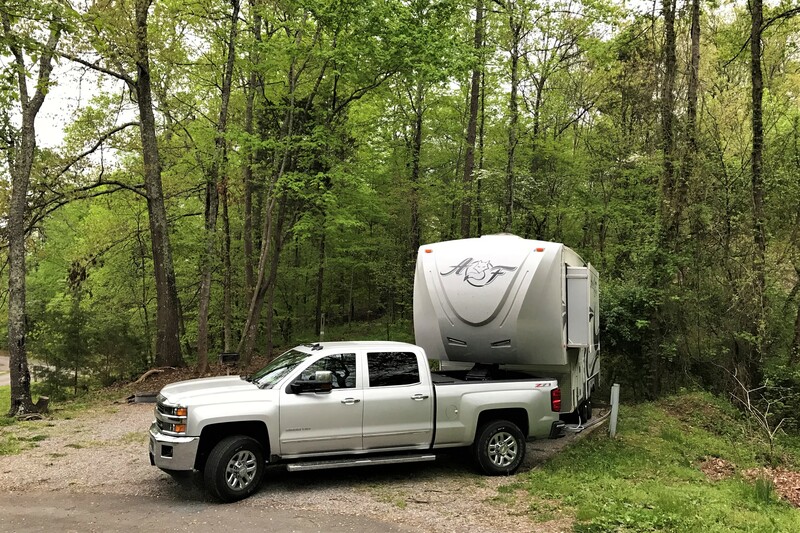 Thursday, April 26,2018: Departing Milton Hill Dam campground on the Clinch River at 1100 and made our way back to I-40 East, then at 1315 crossed the border of North Carolina. 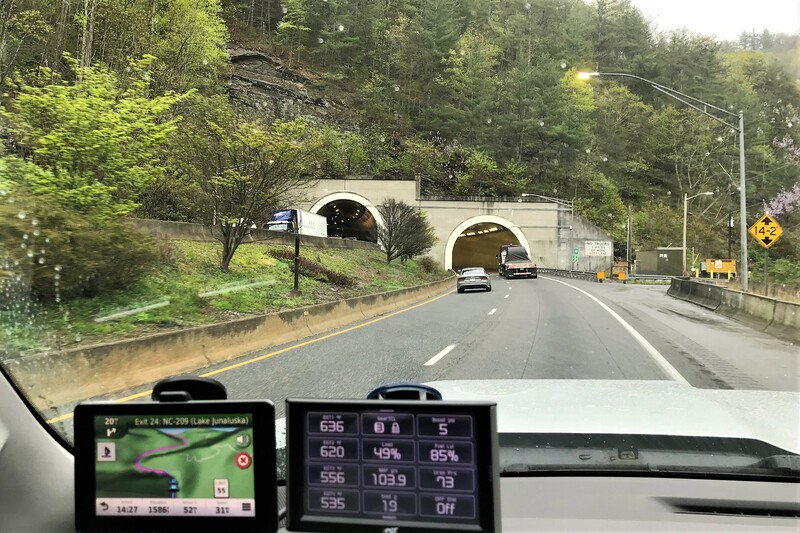 This part of the highway skirts the Great Smoky Mountain National Park and is steep and winding with numerous tunnels…and to add a bit of interest, it started to rain! 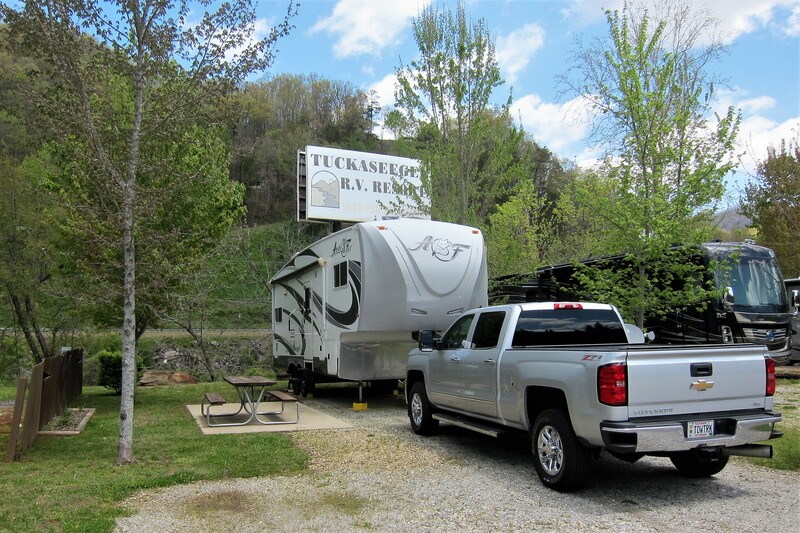 Taking it slow, we made it to our destination of Whittier, NC and pulled into the Tuckasegee RV park. And set up for a two day stay with the Tuckaseegee River roaring outside our rear window. 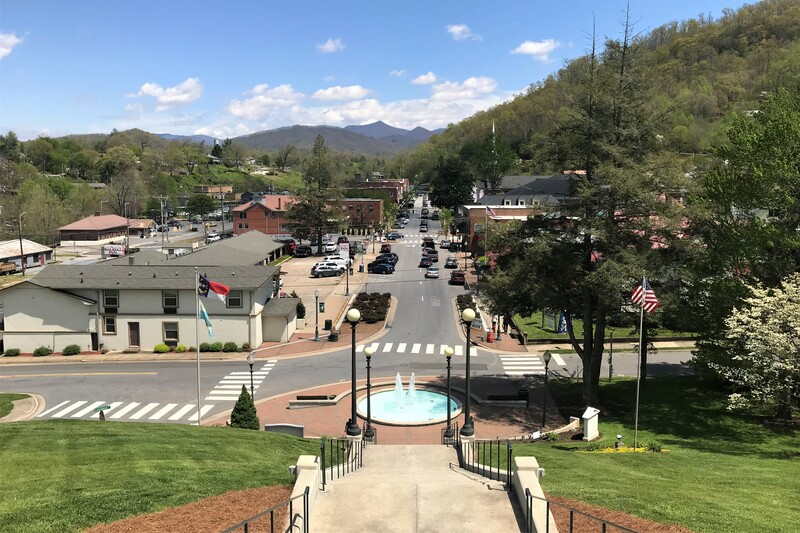 Friday, April 27, 2018-Whittier, NC: So, what are we doing in this North Carolina town of 4,863 folks? Well, to visit with these friends from our Navy days. 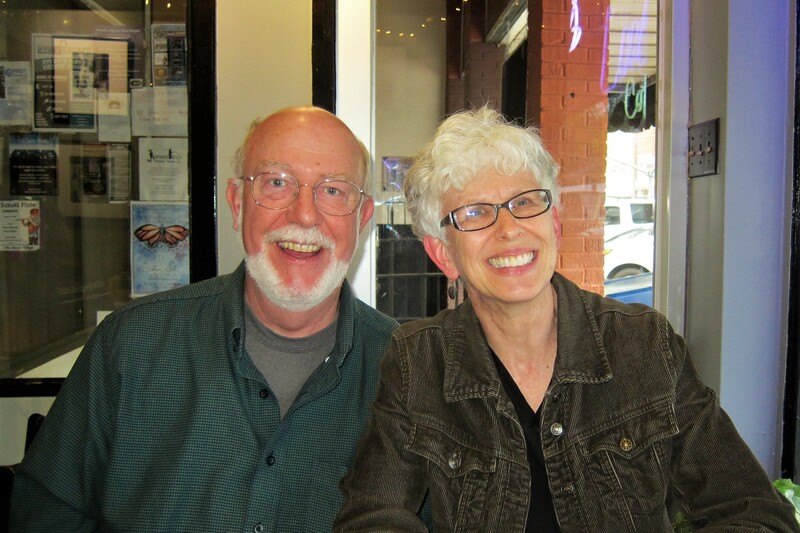 Ted and Debbie, originally from upstate New York, were stationed in Saint Johnsbury, Vermont while we were in the town of Barre, a bit further south. We were Navy Recruiters, and at that time of the 1980’s, there were less than a dozen Navy folks in the entire state, so we pretty much connected and socialized when possible…fast forward some forty years, and we are back at it! Following a great meal at one of their favorite local spots, Ted and Debbie invited Kit and I back to their beautiful mountainside home for coffee and cake, and more great conversation. Really nice seeing you folks after all these years…now, come see us! 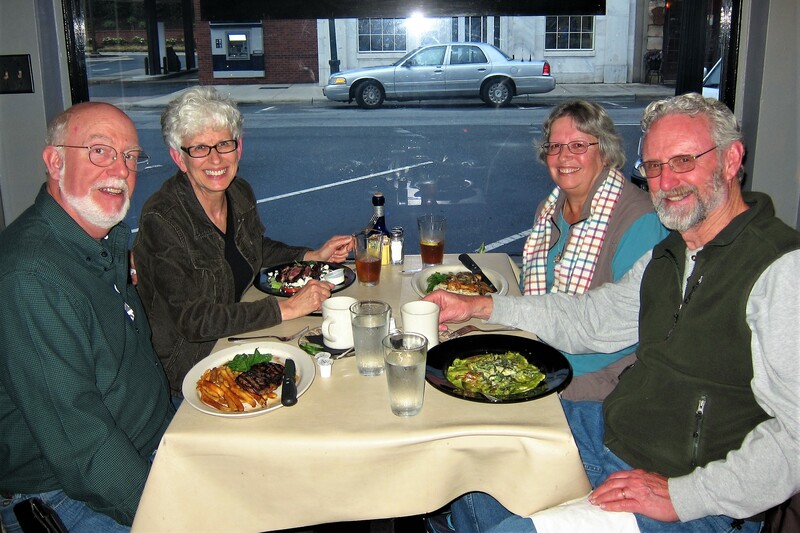 Lulu’s, the place we met Ted and Debbie for dinner is in Sylva, a pretty little mountain town nestled in a valley alongside the Tuckaseegee River. 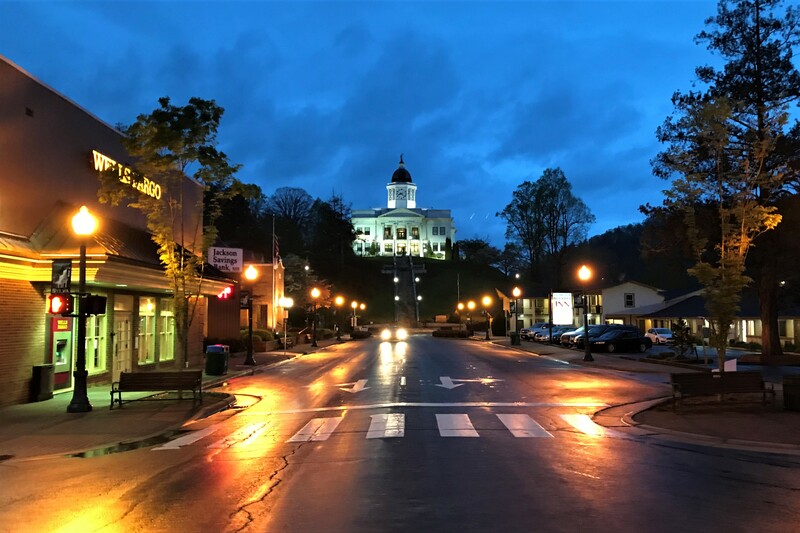 This sleepy little hamlet of 2,644 souls was thrust into the public eye when Hollywood descended on them in 2017 to film the movie, Three Billboards Outside Ebbing Missouri! Neither Kit nor I had seen the film, an oversight quickly solved when Ted purchased the DVD and presented it to us along with a tour of the spots in town that played a prominent part in the filming…such as the Ebbing Police Station. Which was transformed from a consignment shop called Sassy Frass and was the location were Frances McDormand’s character Mildred Hayes threw the Molotov Cocktails…the resulting fire was real, however, what was burning was a façade the production company had built over the existing building. 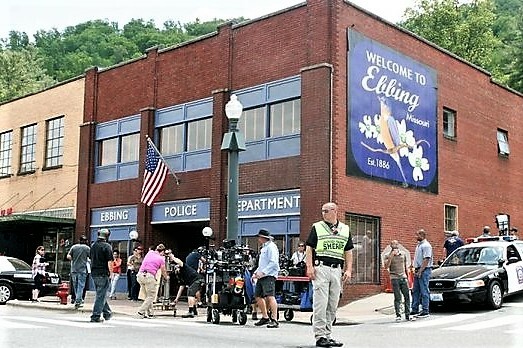 Three Billboards Outside Ebbing Missouri is an intense movie and it was fun seeing the town where much of it was filmed. 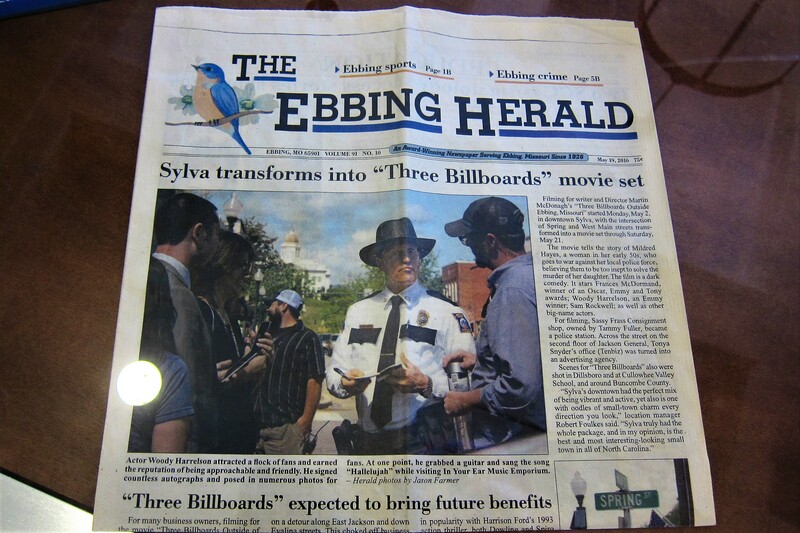 Oh, and as a side note…several other movies were filmed in Sylva, including the 1972 epic Deliverance. 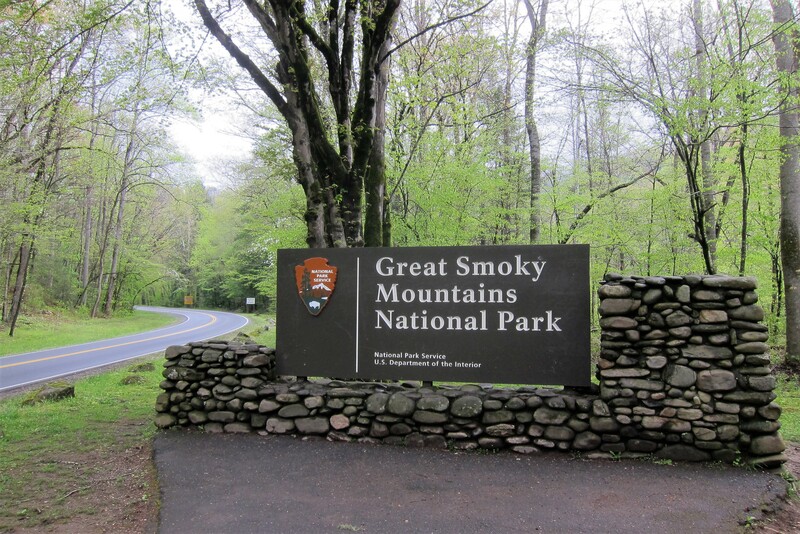 An added bonus to being in this part of North Carolina, is its close proximity to Great Smoky Mountains National Park. Kit wasn’t much interested, so the second morning in town, I took a ride into the park. A major North/South highway, US-44, bisects the park and allows for quickly getting to the interior. 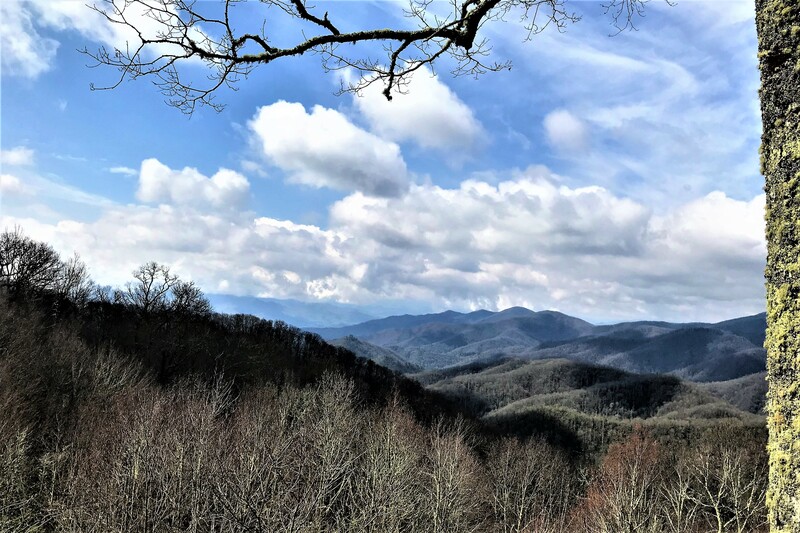 I stopped at most pullouts and overlooks along the way….at 5,046-foot Newfound Gap, there were panoramic views of the Great Smoky Mountain terrain. 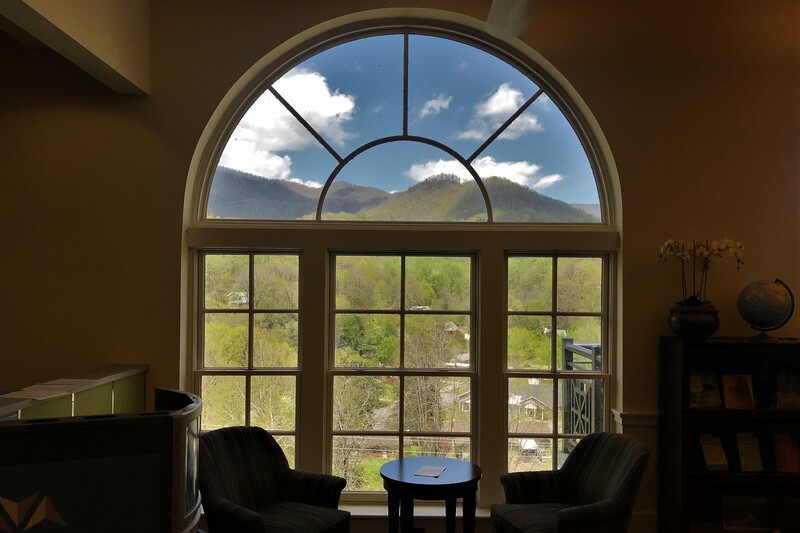 The Smokies, as they are called in these parts, are in the Appalachian Mountain chain and came by their name due to the fog that is created by vegetation releasing moisture into the atmosphere. 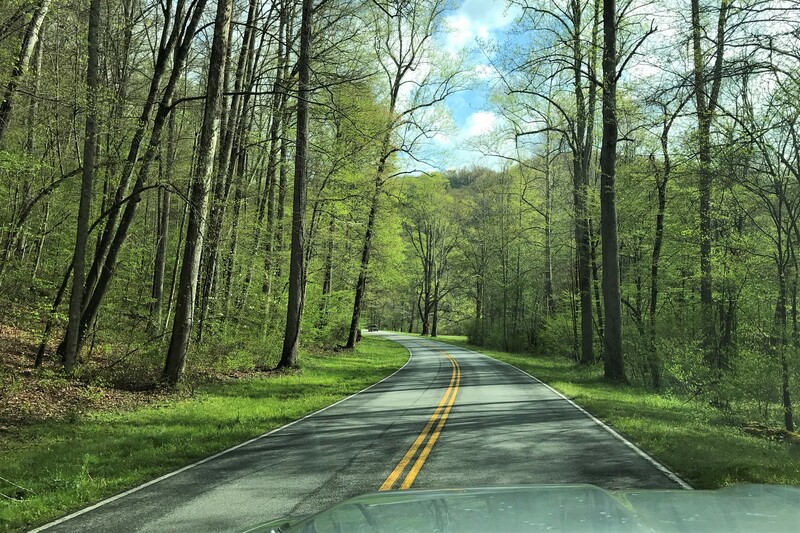 This National Park, established in 1934 boasts over 11,000,000 visitors a year, primarily due to its proximity to large metropolitan areas and US Highway 441. 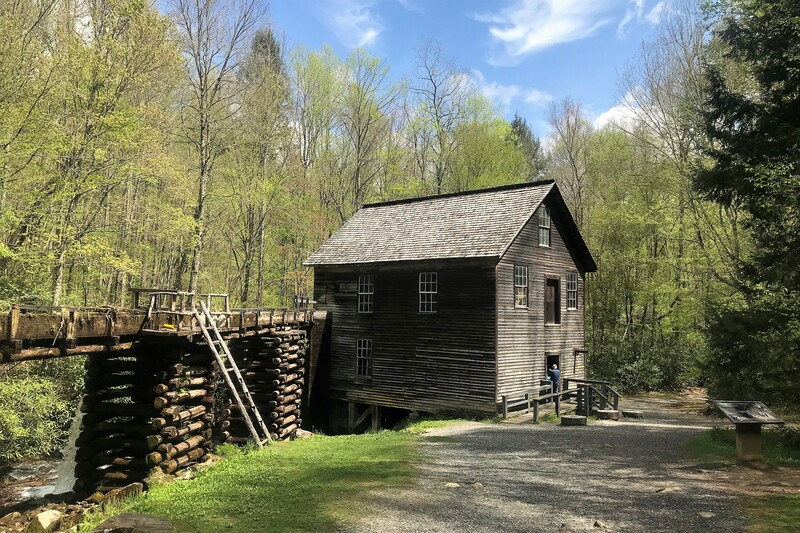 There are many historic structures preserved in the park, including this water powered grist mill. 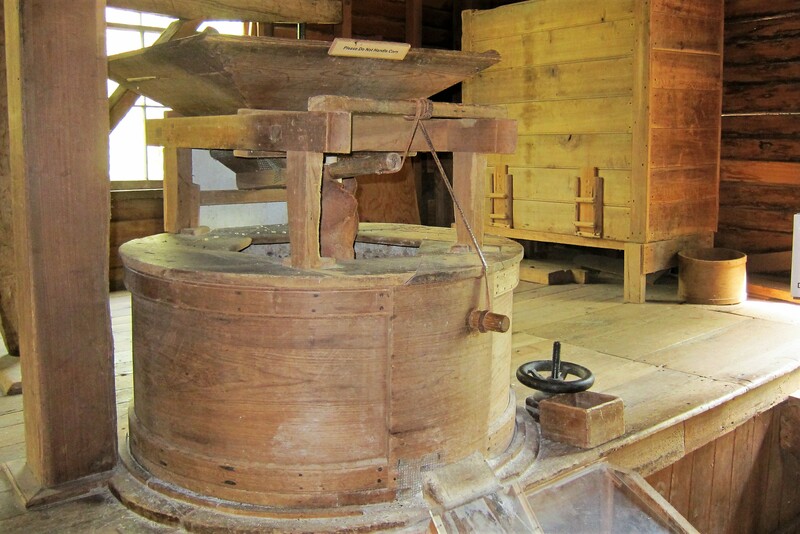 Still functional, the mill ground primarily corn for the many farmers that lived in the lower regions of the area. 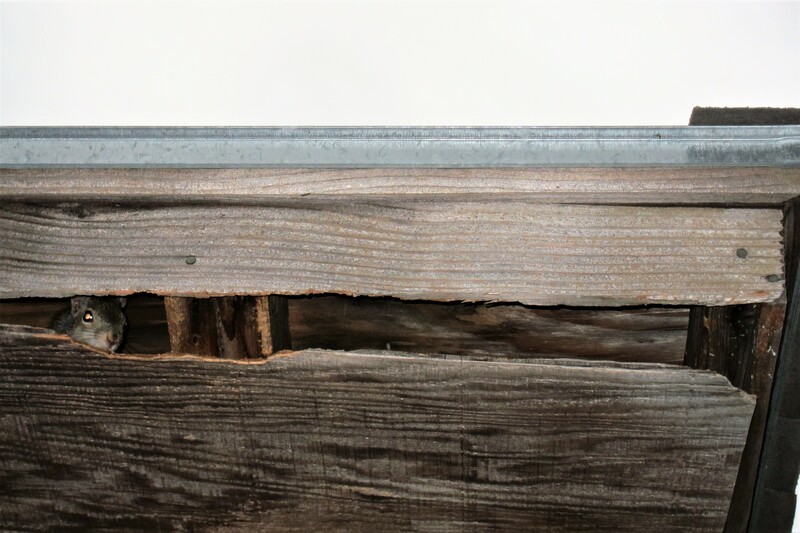 The small square box under the handwheel at lower right holds 1/8 bushel of grain and is the millers pay for each bushel ground…he could save it for personal consumption, or sell it for cash, as he saw fit. A nice morning in the Smokies however I needed to head back as Kit wants to explore more of downtown Sylva. 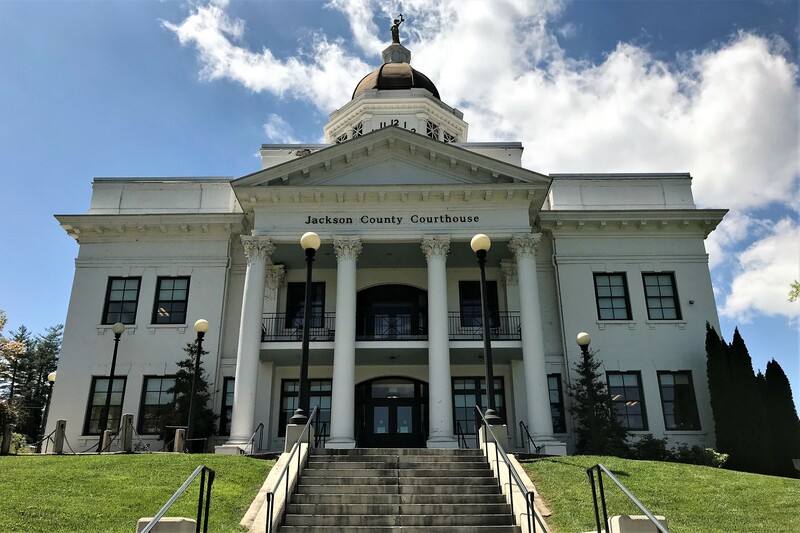 After lunch, we headed for the local library…an imposing structure converted from the old Jackson County Courthouse. Sitting prominently on a hillside at the south end of main street, it allows folks a bird’s eye view of downtown. …as are the vast views from the western facing balcony! Of particular note is the young people’s area. Decorated to simulate a diner! Kit is a big fan of the public library system. 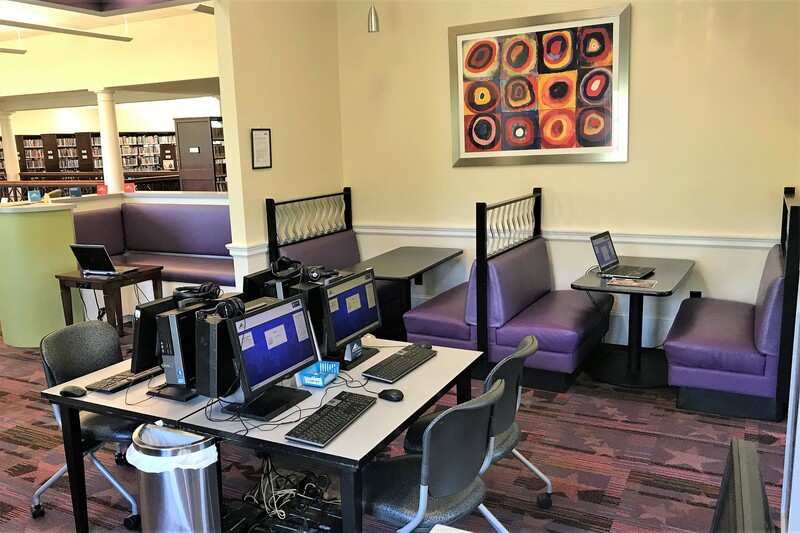 As a young teen, it was the neighborhood library where she escaped to find solace from her large family and immerse herself in the pages of a book. 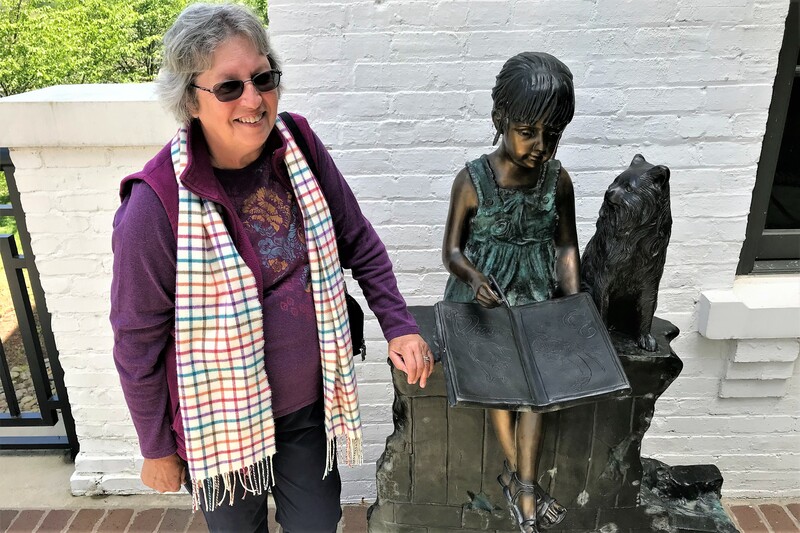 Leaving the hillside library, we drove around the backstreets and neighborhoods of Sylva before parking on Main Street to walk about a bit. This is where we split up…Kit likes to poke around in different shops than I do, so we came to an understanding years ago that it’s best if we go our separate ways. 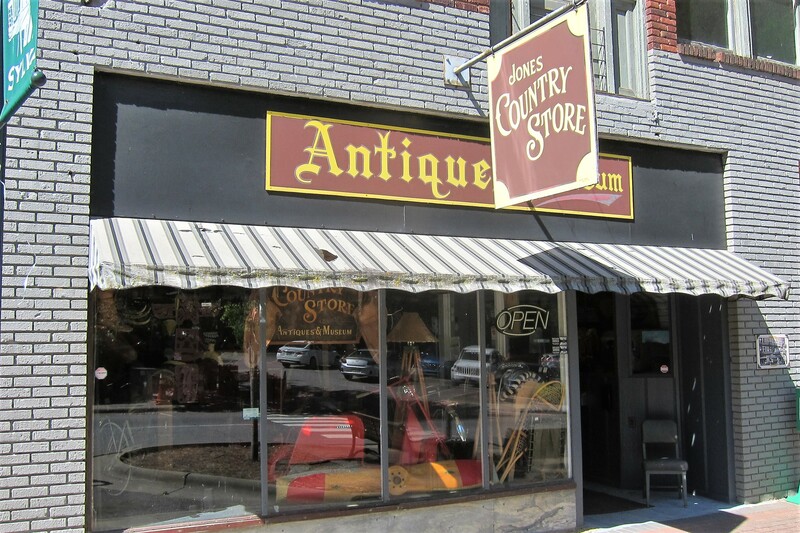 Generally, I like to just walk the streets, take photos, and watch the towns folks go about their day…but spying this store lured me inside. Where I spotted the proprietor wearing a US Navy cap. 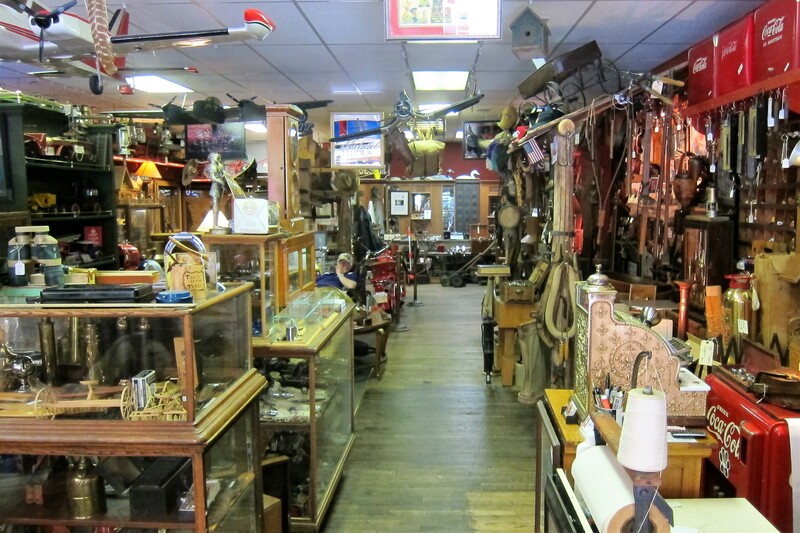 Surrounded by an incredible array of old stuff. Well, this is the place for me! 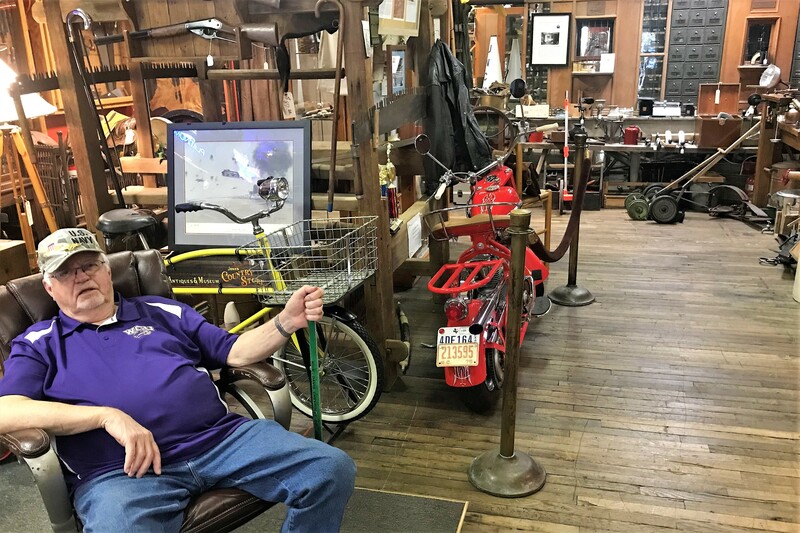 Marion Jones asked me to sit a spell, and the next hour was filled with swapping of Sea Stories and learning about how his hobby of collecting old and interesting items got out of control which resulted in a business. It was then that Kit texted it was time for lunch, so I bid my goodbyes to Marion and located her a few steps away, patiently waiting. Thought about eating in town but decided instead to return to the camper for dinner, and to prepare for our departure tomorrow morning. Well, Kit and I had a wonderful time visiting with Ted and Debbie. We also enjoyed exploring this tiny corner of North Carolina. Tomorrow we pull chocks and continue East…stay tuned! 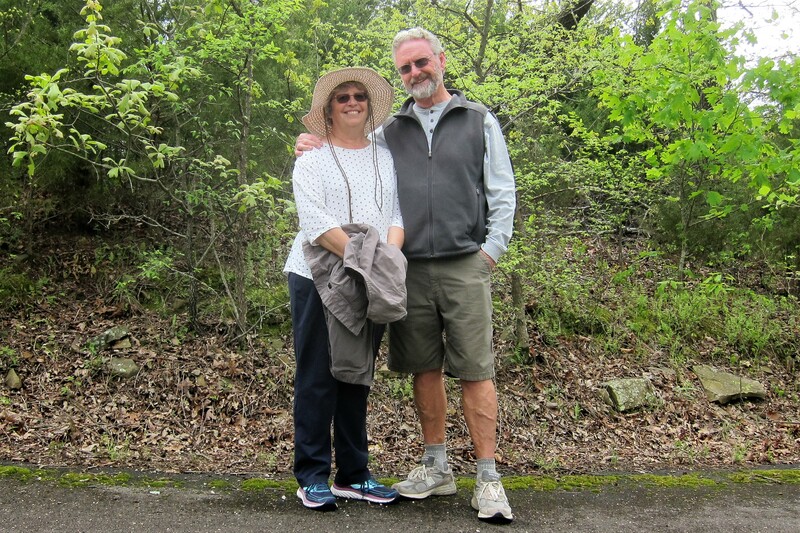 Kit’s Bit’s: We really enjoyed our time with Ted and Debbi! It was nice to reminisce about old times and share the news of our families and lives. It was also a nice respite after the tire blowout! We are so thankful, first for the man who noticed it and told us, as we were both going 60 MPH on the highway and second, for the young man, Alberto, who stopped to help Bill change the tire! He was so kind and helpful, and, at 19 years old, has a bright future ahead of him. Also, he was born in San Diego! He was shocked when we told him SD is our home town. Many thanks, Alberto! Enjoyed this edition! And, it does renew your optimism when you meet a young man like Alberto!! And the San Diego connection just makes the world a little smaller. Will be seeing you soon?! 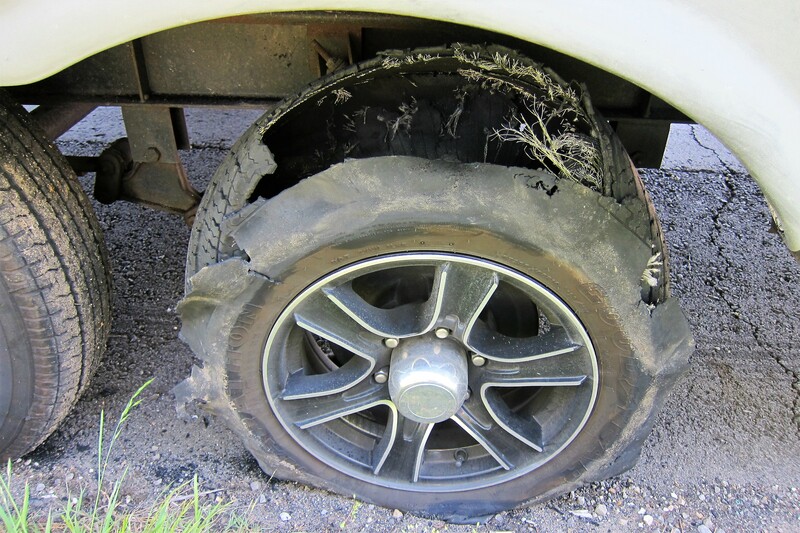 We are thrilled to know a tire blowout did not sent you careening down the highway. Also glad you are rid of the last original tire! You must be home in real time by now.. See you very soon. We are counting the day to home. You know I travel the country vicariously thtough your stories and pictures. Thank you! Don’s parents lived in the Franklin/Otto area, near Sylva, for several years. We use to visit here when we traveled to see his folks. 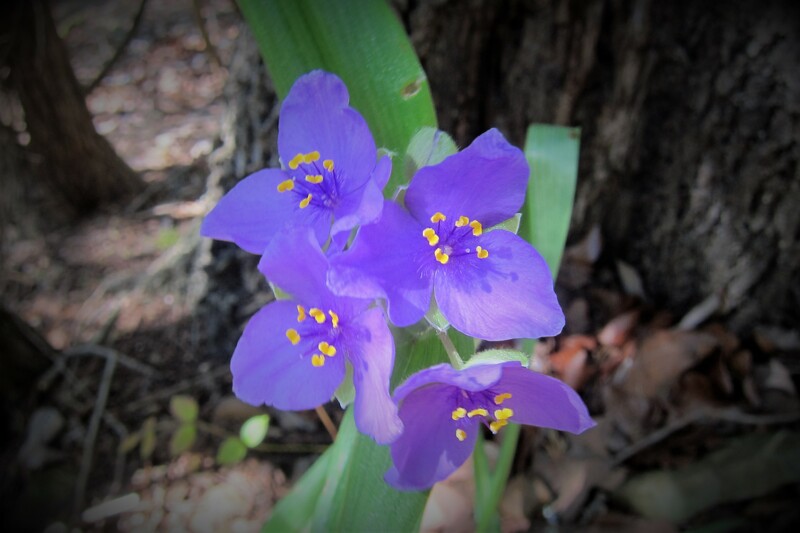 A BREATH OF SPRING AT TENKILLER, WHAT A VIVID GREEN OAK LEAF AND LAVENDER WILD FLOWER. THE BLOWN TIRE INCIDENT SHOULD BE A WARNING FOR ALL RV/ERS TO PAY STRICT ATTENTION TO THEIR RUBBER AND INVEST IN A TPMS. MY TIRE WARNING SYSTEM HAS SAVED ME A FEW TIMES WHEN I PICKED UP A NAIL AND THE PRESSURE WAS LOST. THE RIVER CREST SIGN, BROUGHT BACK SOME VIVID MEMORIES OF OUR 100 YEAR FLOOD HERE ON MERRYMEETING BAY BACK IN THE 1980s. WHAT A TREASURE CHEST MARION JONES HAS AMASSED OVER THE YEARS. HE SHOULD TAKE A MARKETING COURSE AS HE NEGLECTED TO SEND YOU PACKING WITH ONE OF THOSE OLD REEL LAWN MOWERS. LOL DAM! DID I EVER HATE MOWING OUR LAWN WITH THAT BACK BREAKER. NOW THAT’S WHAT I CALL A LIBRARY, THE CONVERTED JACKSON COUNTY COURTHOUSE SURELY IS AN IMPRESSIVE STRUCTURE AND WHAT VIEWS OF THEIR DOWN TOWN. LAST BUT NOT LEAST, ALBERTO WE WISH YOU ALL THE BEST THINGS IN LIFE. HE REMINDS ME SO MUCH OF OUR OWN GRANDSON CODY! THANKS FOR ANOTHER GREAT RIDE!! As always, thank you for sharing your life with us. Very Enjoyable!! !